The 5’4” combines the performance of a small wave surfboard with an incredible throw around factor. 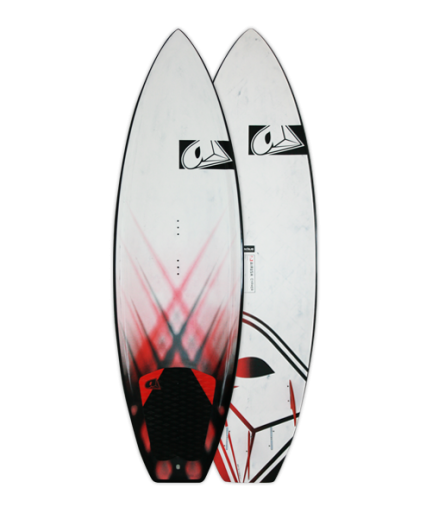 The 5’4” features a concave deck for low center of drive and improved strapless performance. The 5’6” is the perfect all-round performer; the medium volume ensures great performance in a diverse range of onshore to cross-onshore conditions. Ideal for medium to heavier and lightwind riders, the 5’8” absolutely rips while having enough buoyancy for paddle surfing up to an advanced 85 kg rider in small surf (up to shoulder high). The 5’10” has a unique design pushing the envelope of extreme lightwind wave performance by allowing you to ride aggressively in the most marginal conditions. At the same time, the 5’10” Cypher has wave engineered heritage which ensures significant crossover surf potential.